Hank Swigert used to lock up the place at the end of the day. That was when OMSI was located on the hill at Washington Park. To him, it was just another one of the many responsibilities of an OMSI board trustee: make sure the place is safe and secure, ready to provide world-class informal science education to Oregon's children. OMSI kids were Hank's kids. He always wants the best for them. So, Hank made a provision in his will to support OMSI and the future education of generations to come. To this day, Hank believes one of his greatest accomplishments was volunteering as a Trustee for OMSI, and spending 46 years at his family's business. He worked on the shop floor to board chairman and everything in between. 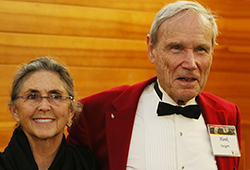 Both institutions revere Hank's commitment, leadership, and generosity. He first got involved with OMSI because his father and uncle were very active community members. They instilled in Hank the idea that one should give back to the community that gave so much to them personally and professionally. His uncle established the C.F. Swigert Jr. Endowment Fund for OMSI's benefit. Hank considers OMSI "as one of Portland's world class resources." He admires the excellent leadership and the importance of providing children and adults science education. Through his support and planned gift, Hank hopes to see OMSI continue to grow its programs and physical footprint for generations to come. When asked who inspires him, Hank confidently states his grandfather and father. These two individuals gave him so much. Their advice was to always take care of your family, employees, and community. Then with a smile full of admiration, he adds that Nancy Stueber, OMSI's president and CEO, is the primary motivation for supporting OMSI and making a bequest in his estate plan. OMSI is honored to add Hank to our J.C. Stevens Legacy Society*. Although Hank is no longer an active OMSI board member, he is a member of our Emeritus Board and the strategic gift task force, and is on the board of directors of his family's business. He is staying very busy as a board member for several other local non-profits and continues to play squash, tennis, and paints.